Your wedding marks the start of your married life together, marked by a ceremony before God, as well as with your friends and family. May God be with you, bringing peace & joy in your marriage. Your wedding ceremony should be personal to you. The minister will be happy to help you plan your own service so that it becomes truly meaningful to you. Take time to consider what you want, write down your ideas and then talk with the minister. It is important to set the date, time and location of the wedding with the minister first and as early as possible. You are asked to let both the minister and the registrar know of any changes to the plan or cancellation as soon as possible. Any rescheduling of dates must be agreed with the minister before changing. Couples are responsible for their own flowers. The church can be opened before the wedding by prior arrangement, and you can, if you wish, remove your flowers after the service. It would be helpful to know beforehand if it is intended to leave any/all of the floral arrangements in the church. Ideally there would be no flash photography during the service, nor any significant moving around that might distract the congregation. Video recordings of the wedding service are permitted, provided the camera is positioned in a fixed and unobtrusive position. Videographers are expected to be discreet and sympathetic to the worship. Couples should note that copyright regulations apply to all hymns and music used at the wedding service and so should ensure that the video company is properly covered for copyright. The use of candles may be incorporated into the marriage ceremony. Confetti should not be thrown inside the church. Outside, it would be appreciated if confetti was biodegradable and not scattered too widely. It is the choice of the couple who will be their attendants on the day. There is the option to allow young ones to sit with families. A convenient time will be chosen, normally one or two days before the service, when all those taking part will be asked to attend (especially the couple, attendants and person escorting the bride). The Marriage Schedule must be brought along to the rehearsal, along with any Orders of Service. Any ushers should arrive at the Church around 45 minutes before the wedding service is due to begin. Their normal duties are to give guests a copy of the Order of Service and to show them to their places in the church. The groom and best man should arrive at the Church by about 30 minutes before the service, bringing with them the Marriage Schedule and the ring(s). 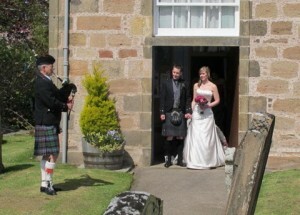 The bride, allowing for photographs, should aim to be on time! Discuss with the minister if you wish to have a guard of honour, a piper, a soloist etc. Most things are possible. Brides requiring a passport in their married name should note that the minister performing the ceremony is required to endorse the passport application form. This may be done up to three months prior to the wedding. The church organists can be contacted to play at weddings, or couples may have musicians they wish to involve. The organist and minister will be very happy to discuss all aspects of the musical requirements for your service. Two or three hymns are normally sung. Consideration should be given to the words you are asking people to sing, and also to the familiarity of tunes. It is normal to have one or two Bible readings. You may like to invite family members or friends to read. In addition, you may wish the words from songs or poems to be read. There are several options for the wording of the vows you will make to each other. The minister will discuss with you the choices and you should take time to consider what would be most appropriate for yourselves. Alternatively, consider writing down what it is you want to promise to be as a wife/husband. The minister would be happy to help you write your own vows. Vows may be repeated line by line after the minister, read from a card or simply confirmed with the words, “I do”. First, submit Marriage Notice forms to the Registrar of Births, Deaths and Marriages for the district where the marriage is to take place. This should be done about two months prior to the wedding date, and at least 28 days before. The Registrar will request all the necessary documents, many of which are available online. When the Registrar is satisfied that there is no legal impediment to the marriage, and that the person who is to solemnise the marriage is an approved celebrant, shortly before the date appointed for the ceremony the Registrar will issue you with a Marriage Schedule, which one of you should collect personally. This is the document that is signed by respective parties at the wedding. This document must be produced to your minister before the ceremony; otherwise, the marriage ceremony cannot proceed. After the ceremony, the Marriage Schedule (now signed by the bride in her maiden name, groom, minister and two witnesses) must be returned within three days to the Registrar so that the marriage can be registered. The above details apply to every marriage conducted in Scotland, civil or religious. You are not required to be a member of this church or any other church to be married in the Edinkillie Church or Dyke Church or by the Minister in another location. You are, however, warmly invited to worship with us on a Sunday at 10.00am in Dyke Church or at 11.30 a.m. I in Edinkillie Church as and when you are able. Should you wish to consider membership of the Church, the Minister will be pleased to discuss this with you. In the Church of Scotland, there is no fee for the services of the minister. However there is normally a fee to both the church officer (who deals with practical arrangements for rehearsals and the day itself) and the organist, as well as for the use of the church building itself. Cheques payable to Dyke and Edinkillie Parish Church; if it is possible for you to pay under Gift Aid, please do so as the Church is able to reclaim the Tax. The appropriate fee can be brought along, in separate envelopes, to the wedding rehearsal. Organist: Fee is currently £100 and to be arranged directly with the organist. Please contact the Organist, Heather Sim, to make arrangements: 07887575961 heather_sim@ymail.com. Our organist’s contract states that she has sole use of the organ; it is at her discretion should you wish an outside party to provide the music. Keys: Please contact the either the Church Officer or Session Clerk Jane Foster (01309 641257) jwaf2212@hotmail.co.uk should you wish access to the church prior to the wedding day.